Trump: Iran may get 'strongest sanctions ever' from U.S.
Trump made the remarks during a Cabinet meeting at the White House. "We have terminated a terrible, terrible deal that should have never, ever been made," he said. "And we will be putting on among the strongest sanctions that we've ever put on a country." Trump told reporters about the plan about 24 hours after officially withdrawing from the Obama-era agreement, calling it "defective at its core." The president, saying the new sanctions are mostly drawn up, explained that he couldn't allow the agreement to continue to "hurt the world." "That's not a deal for the United States. That's a deal to hurt the world and, certainly, Israel." Trump added the deal is was "one-sided" and "not appropriate," and that he's waiting to see how Iran will respond -- but he expects resistance at first. "Probably, we won't do very well with them, but that's okay," he said. "They've got to understand life, because I don't think they do understand life. "But they'll negotiate, or something will happen. And hopefully that won't be the case." Angered by Trump's decision to pull out, Iranian lawmakers said Wednesday the move could lead to the resurrection of Tehran's nuclear program. Iranian President Hassan Rouhani said he hoped European countries, China and Russia can work without the United States to preserve the Joint Comprehensive Plan of Action. But he warned it's possible Iran could once again start its nuclear program. "If you want to have a deal, we need practical guarantees otherwise they will do the same as the U.S.," Rouhani said. "If they can't give definitive guarantees, it won't be possible to continue." 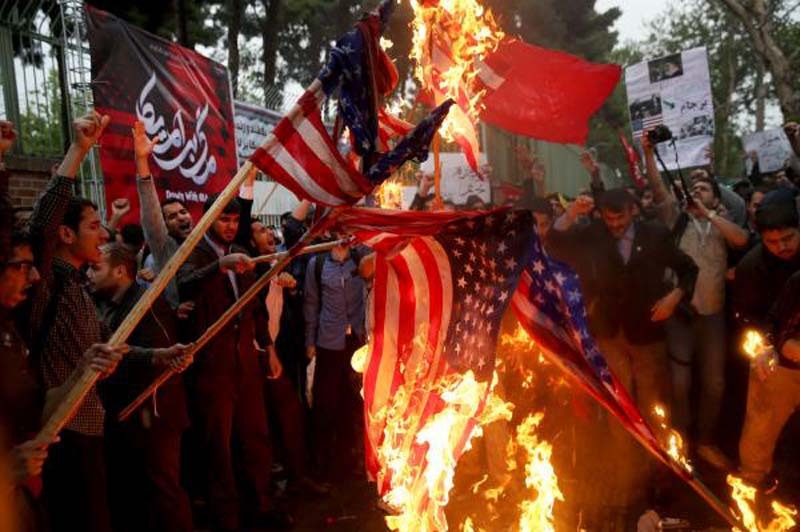 Other Iranian lawmakers responded to Trump by shouting "death to America," and setting fire to U.S. flags. Parliament Speaker Ali Larijani said Trump might lack the "mental capacity" to understand the Obama-era deal. "Under the current situation, Iran has no commitment whatsoever to be put in a position it was in the past as regards the nuclear issue," Larijani added. "I am not sure whether the European signatories of the deal will fulfill their promises." As part of withdrawing from the pact, Trump said the United States will impose "the highest level of economic sanctions" on Iran, including punishment for any country that aids in its nuclear program. The multilateral agreement was brokered in July 2015 by former President Barack Obama's administration, China, Russia, Germany, France, Britain and the European Union -- all of whom expressed disappointment at Trump's move to withdraw. "The international reach of U.S. sanctions makes the U.S. the economic policeman of the planet, and that is not acceptable," French Finance Minister Bruno Le Maire said Wednesday in an interview on France Culture radio. French Foreign Minister Jean-Yves Le Drian said the deal is "not dead," despite Trump's move. In his speech Tuesday, Trump did leave the door open to continue working with Tehran and finding a better agreement to benefit both nations. Wednesday, he said there would be "severe consequences" if Tehran restarted the program. If the deal could be saved, it's not yet clear which government will fill the void left by the United States' departure. "China is the country most likely to fill the shoes of the U.S.," analyst Alex Vatanka, a senior fellow at the Middle East Institute, told Business Insider. "It might not be a bad move for China to speak up and present themselves as the one actor that can come in -- together with the Europeans and the Russians -- to fill the vacuum left by the U.S."
Later Wednesday, Saudi Arabia said it might develop its own nuclear weapon if Iran revives its program. Saudi Arabia "will do whatever it takes to protect [its] people," Saudi Foreign Minister Adel al-Jubeir told CNN. World - U.S. Daily News: Trump: Iran may get 'strongest sanctions ever' from U.S.